Our hybrid linear actuators offer high performance and exceptional endurance to the equipment designer, mounted in a compact package. Engineering plastics are incorporated in the rotor drive nut, running on a stainless steel lead-screw. This material combination generates less noise and offers a lower coefficient of friction than the v-thread with bronze nut combination commonly used in other actuators. Life expectancy is significantly increased over the traditional bronze nut, with no maintenance and no price increase, and while bearing pre-load can be selected at manufacture, it does not protrude outboard of the motor profile. The range covers six square frame sizes, from 21 mm to 87 mm with each size having three design formats available – captive, non-captive and external linear versions. We offer a series of Double Stack actuators which offer increased torque capability for each frame size, available in sizes from 21 mm to 57 mm. An integrated and programmable IDEA Drive is available for the size 17 (43 mm) hybrid and Double Stack hybrid motors. The combinations of motor step size and screw lead available mean we can offer a choice of 28 different travel distances per step, from 0.001524 mm to 0.127 mm. Micro-stepping can be used for even finer resolution and performance optimisation. 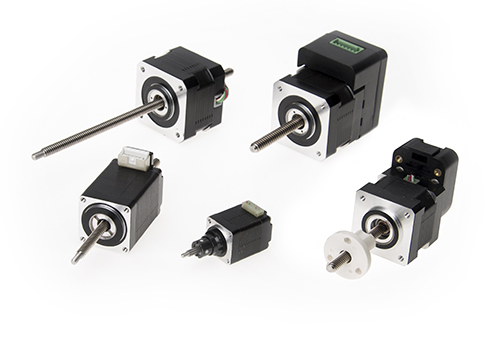 This accuracy and resolution can be used to control a large payload – our 87 mm actuator delivers up to 2224 N of linear force. Typical applications include X-Y tables, medical equipment, semi-conductor handling, telecommunications equipment, valve control and many other uses. We offer specialist motion control design solutions incorporating our standard product range as well as bespoke designs, and our Engineers have extensive experience in the innovative application of our products. Download our catalogue for more information on our range of linear actuators or contact us.